Our daughter is a huge Wizard of Oz fan. We let her decide what she (and we) would be for Halloween this year. She decided on Dorothy, and so it was set! She picked what everyone else would be, including her little sister as the Lion. I always enjoy making my Halloween costumes rather than buying. With the kids, I end up buying parts and pieces from various websites, but don't do too much else. Pink bows were added to the Lion to make it more feminine, but that's about it. Tinman was assembled using various purchases from Amazon. Buttons were glued on, and rub-n-buff was used to give everything a rusted appearance. The boots were second hand rain boots (knee pads were also second hand). Foam sheets were glued in place to give them more of a layered look, and buttons were added to these as well before painting them silver! 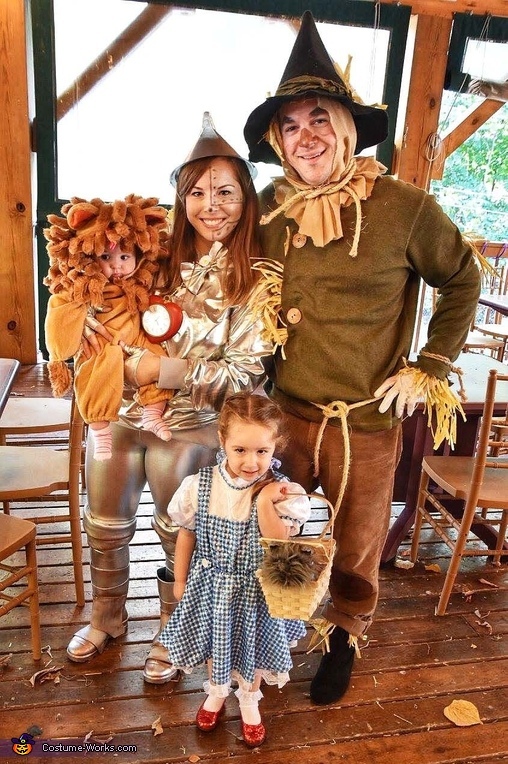 It was the most fun we've had dressing up, as our daughter was so excited to be Dorothy all day, every day leading up to Halloween! Now I'm trying to get the costume exposure because it's pretty accurate to the film, and the cutest thing ever!! !